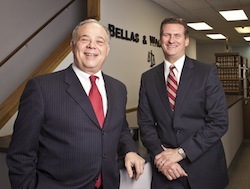 George Bellas started what is now Bellas & Wachowski Attorneys at Law after leaving his position as a prosecuting attorney in 1973. The firm consists of six attorneys and six support team members working in areas such as business law, business litigation and personal injury claims. Our law offices are located in the Chicago area, near O'Hare Airport and easy for our clients to reach from anywhere in the Chicago area. The history of our firm is, in large part, the history of our firm partners, George Bellas and Peter Wachowski. In its annual survey of attorneys who have obtained a high degree of peer recognition and professional achievement, Law & Politics has selected George Bellas as an Illinois Super Lawyer for twelve years in the practice area of business litigation. A "Super Lawyer" is selected for this award by other attorneys who were asked to nominate the best attorneys they have personally observed in action. George was a recipient of the prestigious Steven Sharp Public Service Award by the Association of Trial Lawyers of America (ATLA) for his work in helping educate the public on the risk of SUV rollovers and of the Firestone tire and Ford Explorer recall. George has also been named as one of the Top 100 Trial Lawyers in Illinois and is a member of the Million Dollar Advocates Forum. George recently settled a class action lawsuit against a Fortune 100 company involving claims under the Federal Family Medical Leave Act ("FMLA"). The case was unprecedented in that the U.S. District Court for the Northern District of Illinois ordered the claims to proceed as a class action under the Federal Rules Of Civil Procedure. The suit alleged that management was improperly tracking productivity measures and impermissively included time taken for FMLA to determine performance. George Bellas, in association with Clifford Law Offices, filed a series of class actions against several not-for-profit hospitals alleging that these not-for-profits violate their tax exempt status by overcharging uninsured and indigent patients and then employing strong-arm tactics to collect from the indigent and uninsured, driving many people into bankruptcy. These lawsuits were featured in Time magazine and on ABC's Primetime. One of those cases against a large Cook County hospital system settled in an unprecedented settlement. The firm of Bellas & Wachowski Attorneys at Law filed one of the first cases involving contaminated dog food and which consolidated into a nationwide class action. A nationwide settlement was agreed to and approved by the court. While working with Clifford Law Offices, George obtained $22.5 million in a settlement of a case involving the rollover of a 1992 Ford Explorer which left two teenagers dead and another a quadriplegic. The 1992 Explorer rolled over after being struck by the driver's side rear wheel well by a Plymouth Sundance while traveling on the Eisenhower Expressway. It was alleged that the Ford Explorer had design defects that rendered it inherently unstable and that Ford's own testing showed that the Explorer was prone to roll over with only minimal variations in tire size, type and air pressure. George has since been involved with numerous Explorer rollover cases throughout the U.S. In the area of complex business litigation, George Bellas has few peers. For example, successfully prosecuted claims against a multi-national corporation in the United States District Court in Chicago on behalf of a Brazilian business owner. The claims involved breaches of a joint venture and distributorship agreement. The cases settled with the terms subject to a confidentiality agreement. George has authored numerous articles including, "Electronic Discovery: Wave Goodbye to Paper," which was published in the Trial Journal of the Illinois Trial Lawyers. George addressed the Annual Meeting of the Midwest Association of Technical Accident Investigators ("MATAI") in Sioux, City, Iowa. The topic of the presentation was "Sport Utility Vehicles: Is Bigger Safer?" MATAI consists primarily of accident investigators from eight states consisting primarily of state troopers from these states. In this annual meeting the attendees were also shown a demonstration of a test of an accident avoidance maneuver of a Sport Utility Vehicle which resulted in a rollover crush. An article by George Bellas was featured in Trial magazine published by the Association of Trial Lawyers of America (ATLA). The article was titled, "Portable Litigation Support." This was a follow up to a presentation made by George at the annual meeting of ATLA regarding the use of portable litigation support. George was also featured in an article in the National Law Journal in which George discussed how Summation was used to help manage documents in connection with rollover litigation. The Sedona Conference in April, 2005, focused on Litigation of Mass Torts, and George was invited to participate as a faculty member of this prestigious organization. George is now a member of the 7th Circuit e-Discovery Committee. George also gave a presentation entitled "Explorer: More Than Just the Tires" to the Products Liability Section of the Association of Trial Lawyers of America (ATLA) at their Annual Meeting in Montreal. He also addressed the Ohio Academy of Trial Lawyers to discuss automobile rollover litigation and recently his articles were published by the Colorado Trial Lawyers, the Utah Trial Lawyers Association, and the Illinois Trial Lawyers Association. Peter Wachowski was recognized as one of "40 Lawyers under 40 to Watch in Chicago" by the Chicago Daily Law Bulletin. This is a very unique honor and recognizes the accomplishments of Peter in serving the needs of his clients and the community. Peter has served as President of the Advocates Society, which is the bar association for Polish-American attorneys. Peter is completely literate in Polish. Peter has been admitted to practice since 1990, and is a member of the American, Illinois and Chicago Bar Associations. He also managed his family's construction business, giving him valuable experience in the needs of general contractors. Peter and George were recently awarded lifetime memberships in the National Registry of Who's Who in America. Peter has been rated "Excellent" and "Recommended" by Martindale-Hubbell Legal Directory. Peter successfully argued a case before the Illinois Supreme Court in which a murder conviction was reversed. Please contact Bellas & Wachowski Attorneys at Law about any questions about our firm, or to set up a consultation about your legal issues.